Free event at Bridge Rectifier – all welcome . . . . Book Sat 11th August (starting at 10am – 3:30pm). laser-cutter? No previous experience needed. 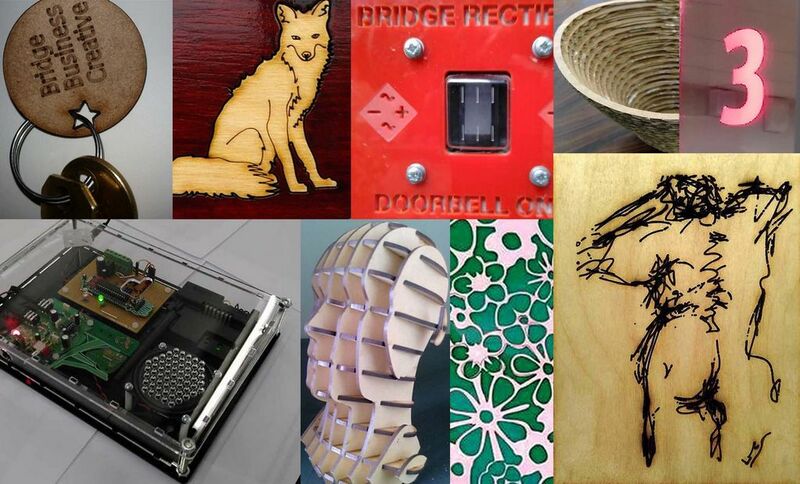 Come along to a free workshop at Bridge Rectifier to learn basic computer-aided design & laser-cutting. Laser-cutting can be used for: artwork, attractive cases, mechanical components, special mountings, perforated lampshades, intricate paper cuts/ invitation cards, even 3D forms from stacked horizontal or vertical slices . . . .
Materials include: acrylic sheet, wood, cardboard, paper, other natural materials, or even engrave onto glass . . . .
Produce your own simple piece to take away, free of charge. Once trained, you can continue your own projects for a very low charge, with a group of enthusiasts working on diverse projects. Please email any queries to:info@bridgerectifier.org.uk. Hi, do I book a slot through here? I’m completely flexible so whatever you have, let me know what time is best for you.